Do you play hockey and occasionally you lose your confidence? In “Sports Psychology Sessions with Doc,” Dr. Patrick Cohn answers a question from Matt who wants to know how to help his young hockey goalie build confidence and competitiveness. How to stabilize that confidence or keep it on a steady state instead of being on the confidence roller coaster. 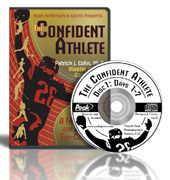 You don’t want your athletes on the confidence roller coaster or have fragile confidence, you want them to have stable or long term confidence. What should you do to help your young athlete stay confident during momentum changes?